Lean Pro® Muscle Building Protein Blend (Yielding Fast Acting Micro Ultra Filtered Whey Protein Concentrate, Cross Flow Micro Ultra Filtered Whey Protein Isolate, Hydrolyzed Whey Protein Isolate, Medium Acting Agglomerated Egg Albumin, Slow Acting Micellar Casein, Calcium Caseinate, Milk Protein Isolate, Milk Protein Concentrate, Glutamine Peptides), EFA Plex™ High Energy Essential Fats (Sunflower Oil, Non-Dairy Creamer [High Oleic Sunflower Oil, Fructose, Sucrose, Di-Potassium Phosphate, Tri-Calcium Phosphate, Soy Lecithin, Tocopherols], MCT Oil, Flaxseed Oil, Borage Oil), Natural And Artificial Flavorings, Cocoa, MCT Powder (Medium Chain Triglycerides, Non-Fat Dry Milk, Disodium Phosphate, Silicon Dioxide), Fiber Plex™ High Fiber Complex (Polydextrose, Fibersol 2 Fiber, Inulin, Cellulose Gum, Xanthan Gum), Salt, Sucralose, Acesulfame Potassium. Contains Milk, Egg, Soy (Lecithin). Contains Milk, Egg, Soy (lecithin), Wheat. Note: Soy lecithin helps the powder to dissolve in water. LeanPro® Muscle Building Protein Blend (Yielding Fast Acting Micro Ultra Filtered Whey Protein Concentrate, Cross Flow Micro Ultra Filtered Whey Protein Isolate, Hydrolyzed Whey Protein Isolate, Medium Acting Agglomerated Egg Albumin, Slow Acting Micellar Casein, Calcium Caseinate, Milk Protein Isolate, Milk Protein Concentrate, Glutamine Peptides), EFA Plex™ High Energy Essential Fats (Sunflower Oil, Non-Dairy Creamer [High Oleic Sunflower Oil, Fructose, Sucrose, Di-Potassium Phosphate, Tri-Calcium Phosphate, Soy Lecithin, Tocopherols], MCT Oil, Flaxseed Oil, Borage Oil), Cookie Pieces (Sugar, Enriched Flour [Wheat Flour, Niacin, Reduced Iron, Thiamin Mononitrate, Riboflavin, Folic Acid], Soybean and, Palm Oil, Dutched Cocoa, Invert Sugar, Cornstarch, Chocolate, Salt, Baking Soda, Monocalcium Phosphate), Natural And Artificial Flavorings, Cocoa, MCT Powder (Medium Chain Triglycerides, Non-Fat Dry Milk, Di-Sodium Phosphate, Silicon Dioxide), Fiber Plex™ High Fiber Complex (Polydextrose, Fibersol 2 Fiber, Inulin, Cellulose Gum, Xanthan Gum), Salt, Sucralose, Acesulfame Potassium. LeanPro® Muscle Building Protein Blend (Yielding Fast Acting Micro Ultra Filtered Whey Protein Concentrate, Cross Flow Micro Ultra Filtered Whey Protein Isolate, Hydrolyzed Whey Protein Isolate, Medium Acting Agglomerated Egg Albumin, Slow Acting Micellar Casein, Calcium Caseinate, Milk Protein Isolate, Milk Protein Concentrate, Glutamine Peptides), EFA Plex™ High Energy Essential Fats (Sunflower Oil, Non-Dairy Creamer [High Oleic Sunflower Oil, Fructose, Sucrose, Di-Potassium Phosphate, Tri-Calcium Phosphate, Soy Lecithin, Tocopherols], MCT Oil, Flaxseed Oil, Borage Oil), Natural & Artificial Flavorings, MCT Powder (Medium Chain Triglycerides, Non-Fat Dry Milk, Di-Sodium Phosphate, Silicon Dioxide), Fiber Plex™ High Fiber Complex (Polydextrose, Fibersol 2 Fiber, Inulin, Cellulose Gum, Xanthan Gum), Salt, Beet Powder, Sucralose, Acesulfame Potassium. 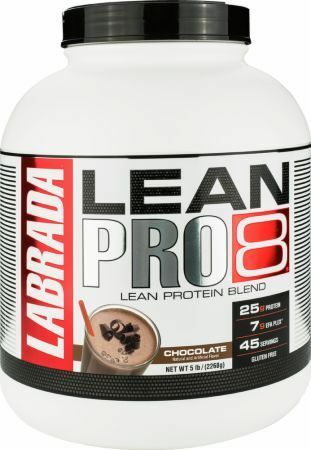 Lean Pro® Muscle Building Protein Blend (Yielding Fast Acting Micro Ultra Filtered Whey Protein Concentrate, Cross Flow Micro Ultra Filtered Whey Protein Isolate, Hydrolyzed Whey Protein Isolate, Medium Acting Agglomerated Egg Albumin, Slow Acting Micellar Casein, Calcium Caseinate, Milk Protein Isolate, Milk Protein Concentrate, Glutamine Peptides), EFA Plex™ High Energy Essential Fats (Sunflower Oil, Non-Dairy Creamer [High Oleic Sunflower Oil, Fructose, Sucrose, Di-Potassium Phosphate, Tri-Calcium Phosphate, Soy Lecithin, Tocopherols], MCT Oil, Flaxseed Oil, Borage Oil), Natural And Artificial Flavorings, MCT Powder (Medium Chain Triglycerides, Non-Fat Dry Milk, Disodium Phosphate, Silicon Dioxide), Fiber Plex™ High Fiber Complex (Polydextrose, Fibersol 2 Fiber, Inulin, Cellulose Gum, Xanthan Gum), Salt, Sucralose, Acesulfame Potassium. LeanPro® Super Premium Protein Blend (Yielding Fast Acting Micro Ultra Filtered Whey Protein Concentrate, Cross Flow Micro Ultra Filtered Whey Protein Isolate, Hydrolyzed Whey Protein Isolate, Medium Acting Agglomerated Egg Albumin, Slow Acting Micellar Casein, Calcium Caseinate, Milk Protein Isolate, Milk Protein Concentrate, Glutamine Peptides), EFA Plex™ High Energy Essential Fats (Sunflower Oil, Non-Dairy Creamer [High Oleic Sunflower Oil, Fructose, Sucrose, Di-Potassium Phosphate, Tri-Calcium Phosphate, Soy Lecithin, Tocopherols], MCT Oil, Flaxseed Oil, Borage Oil), Natural & Artificial Flavorings, Cocoa, MCT Powder (Medium Chain Triglycerides, Non-Fat Dry Milk, Disodium Phosphate, Silicon Dioxide), Fiber Plex™ High Fiber Complex (Polydextrose, Fibersol 2 Fiber, Inulin, Cellulose Gum, Xanthan Gum), Salt, Sucralose, Acesulfame Potassium. LeanPro® Muscle Building Protein Blend (Yielding Fast Acting Micro Ultra Filtered Whey Protein Concentrate, Cross Flow Micro Ultra Filtered Whey Protein Isolate, Hydrolyzed Whey Protein Isolate, Medium Acting Agglomerated Egg Albumin, Slow Acting Micellar Casein, Calcium Caseinate, Milk Protein Isolate, Milk Protein Concentrate, Glutamine Peptides), EFA Plex™ High Energy Essential Fats (Sunflower Oil, Non-Dairy Creamer [High Oleic Sunflower Oil, Fructose, Sucrose, Di-Potassium Phosphate, Tri-Calcium Phosphate, Soy Lecithin, Tocopherols], MCT Oil, Flaxseed Oil, Borage Oil), Natural & Artificial Flavorings, Cocoa, MCT Powder (Medium Chain Triglycerides, Non-Fat Dry Milk, Di-Sodium Phosphate, Silicon Dioxide), Fiber Plex™ High Fiber Complex (Polydextrose, Fibersol 2 Fiber, Inulin, Cellulose Gum, Xanthan Gum), Salt, Sucralose, Acesulfame Potassium. LeanPro® Muscle Building Protein Blend (Yielding Fast Acting Micro Ultra Filtered Whey Protein Concentrate, Cross Flow Micro Ultra Filtered Whey Protein Isolate, Hydrolyzed Whey Protein Isolate, Medium Acting Agglomerated Egg Albumin, Slow Acting Micellar Casein, Calcium Caseinate, Milk Protein Isolate, Milk Protein Concentrate, Glutamine Peptides), EFA Plex™ High Energy Essential Fats (Sunflower Oil, Non-Dairy Creamer [High Oleic Sunflower Oil, Fructose, Sucrose, Di-Potassium Phosphate, Tri-Calcium Phosphate, Soy Lecithin, Tocopherols], MCT Oil, Flaxseed Oil, Borage Oil), Natural & Artificial Flavorings, MCT Powder (Medium Chain Triglycerides, Non-Fat Dry Milk, Di-Sodium Phosphate, Silicon Dioxide), Fiber Plex™ High Fiber Complex (Polydextrose, Fibersol 2 Fiber, Inulin, Cellulose Gum, Xanthan Gum), Salt, Sucralose, Acesulfame Potassium.